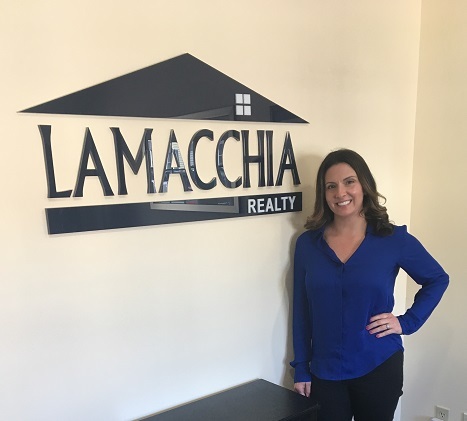 Lamacchia Realty – Today Nicole LeBlanc officially became one of Lamacchia Realty’s Worcester and Westford based Business Development Consultant. In this position, she will consult Realtors at Lamacchia Realty on best practices for growing their businesses, as well as, enhancing the company’s Realtor development in the company’s Worcester and Westford offices. Nicole grew up in Ashburnham Massachusetts and attended Fitchburg State College where she received her Bachelor’s Degree in Early Childhood Education and Psychology. In 2006 Nicole opened her own preschool program through Early Education and Care for 10 years. She then went on to teach an ESL program for Worcester Public Schools. Nicole also worked for LUK Crisis Center in Fitchburg, working with foster care children and families through Department of Social Services. While running the preschool business in 2014 she obtained her real estate license working part-time and easing herself into the business. It is extremely evident with her diverse previous careers, that genuinely helping people is her passion. Since obtaining her real estate license she has worked with many buyers, sellers and investors. Nicole loves the real estate business and feels she has found a true passion for helping people. Nicole chose to work for Lamacchia Realty because it is the most innovative company out there. The systems, training, and organization of the company are amazing. The amount of support and “caring” for their agents is next to no other real estate company. Because she embodies these attributes as much as the company, it became evident that her people skills, willingness to help others, and understanding of the importance of training and support would be best used as a Business Development Consultant for Lamacchia’s Worcester and Westford offices. “I am BEYOND excited to begin this new journey with Lamacchia Realty business development team. I feel extremely blessed to be part of this growing empire. I look forward to being a support for our current agents and agents entering our company. I take pride in helping others reach their max potential and can’t wait to dive in. Most importantly, I look forward to working with all of the current staff! I admire how far this company has come and I am thrilled to be part of the continuing growth.” – Nicole LeBlanc, Business Development Consultant. In this position, Nicole will report to the company’s Director of Growth and Development, Jackie Louh. Jackie’s team is responsible for growing the company by assisting existing Lamacchia agents with training, proper onboarding, familiarity with the company, as well as, attracting additional like-minded Realtors with a hunger to learn and grow their business into the company. Lamacchia Realty was excited to open its doors to its brand-new renovated office in Worcester last June. Since then the number of agents working out of this office has grown tremendously and still continues to. Recently, Lamacchia Realty was named #1 Independent Real Estate Brokerage in Waltham, Norwood, and Worcester for 2018. Lamacchia Realty’s aggressive marketing strategies, unique programs for buyers and sellers, as well as the cutting-edge products, services, and tools offered to its Realtors all contribute to the company’s growing success. On average, agents who join Lamacchia more than triple their business in their first twelve months. Lamacchia Realty agents demonstrate the highest level of integrity and determination and provide exceptional service while implementing the innovative strategies they learn from the companies REAL training program. Lamacchia Realty’s mission is to provide industry-leading training, support, systems, and technology to its agents and employees so they can reach their fullest potential. To learn more about what the Realtors at Lamacchia think of the company watch this video from our “Get More with Lamacchia” video series by clicking here.